Michael Fitzpatrick Selected to Make a Piece for the yearly fundraiser. 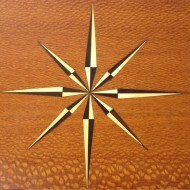 Selected this year by the MFA for the “Give the Arts a Chance” Auction, this 1/2 Ellipse Table is made of Bubinga, Kewazinga (Waterfall Bubinga), has an inlaid compass star of Holly and Ebony. Secondary Woods are cherry and poplar. Dimensions: 42”wide X 30”high X 12”deep.